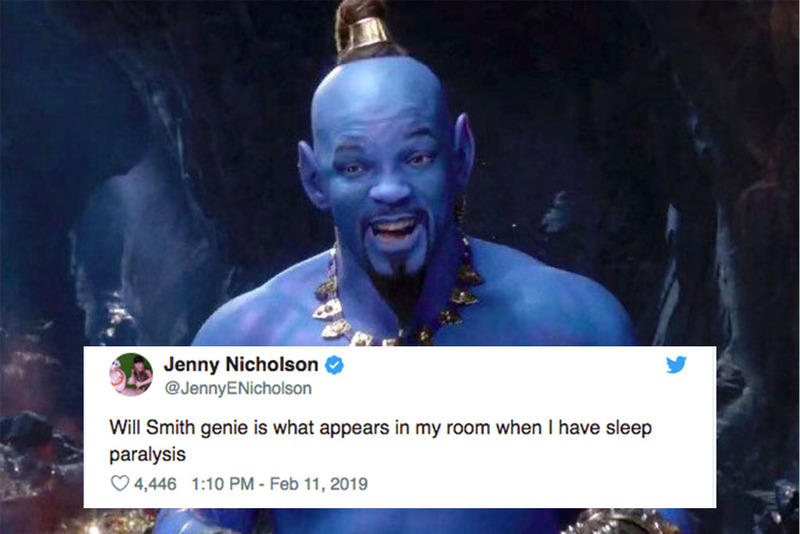 I don’t necessarily know that it was the cgi that was the worst part with that short of a clip, but I do know that it did not at all feel like the genie. It's hard for anyone to follow Williams here, but it really doesn't feel right. I was expecting to be wow'ed and it just came off unusual. He tried to push his weird son and weird daughter into the spotlight. To me, that was when the Will Smith magic ended. I just cringe when I see WS now. As expected, Will Smith is just acting like Will Smith covered in blue make up. And did not Robin Williams just act like himself? Guaranteed WS will, at some point in this movie, say "ah hell no"
Jafar is a bigger miss than the Genie. Isn’t there a rumor that the Genie will only be blue for a portion of the movie? Disney needs to chill with these live action remakes of their classic animation movies. Yes Lion King will probably do very well but it was an all timer. You can't repeat the success of Robin Williams in that role so why even try? And Mulan? Why bother? By the Genie reveal I was still stunned by how badly they cast Jafar. WTF. Put a voice modulator on the dude. Why didn't they just make him person sized for frick sake? He looks ridiculous. Why even paint him? Jesus Christ this is so bad looking. Yeah, that looks so cheesy. Just make him a person. He could still be blue. But CGI'ing his face on the genie "body" looks bad. It looks like the baby face in the sun in teletubbies (i have kids). I am a huge Aladdin fan but won’t be watching this one. Horrible casting and racist even if you want to say that they made Jasmine Indian instead of you know an actual Arab since those two are the same thing and all. Are you this ignorant that you think Indians are Middle Eastern? People were pissed because Disney didn’t give a shot that there is kind of a huge difference between the two cultures and Indians and Pakistanis are not in there Middle East. If they don’t use the OG Arabian night lyrics, the film is dead to me. Where they cut off your ear if they don’t like your face, it’s barbaric, but hey, it’s home! Trying to live up to the Robin Williams version is basically an impossible task, you’d have to go get Daniel Day Lewis to make that happen. At some point people are going to realize that none of these live action remakes will match the magic of the originals. They're going to keep making them. Just get used to seeing decent films that are entertaining but not close to the levels of the animated features. You'll see it on cable or the Disney app and think, eh, it was okay I guess. Just like The NEW Jungle Book, The NEW Beauty and the Beast, etc., etc. People were pissed because Disney didn’t give a shot that there is kind of a huge difference between the two cultures and Indians and Pakistanis are not in there Middle East. Lol frick right off with complaining that they cast someone of a different ethnic background for this. Unless you were against all the times they made white characters into non-white ones.